I’ve recently started to get into Bourbon. All this drink used to bring to mind was rednecks, Jim Beam and sticky sweet coke as a mixer. I prefer the seemingly more sophisticated taste of scotch whiskey – Laphroaig being my favourite of the Islay range. But then a good friend hosted a whiskey appreciation night. Amongst them we got to try Blanton’s Single Barrel Special Reserve Bourbon and I really liked it. At first I’m sure it was jaunty horse on the lid of the bottle that took my fancy, but the taste got me too. It was so smooth and tasty. It was a night of surprises. My friend, G, set up the whiskeys in range of cheapest to most expensive so the bottle of Blue Label Johnnie Walker made it’s appearance last. What a disappointment that turned out to be. It’s a blended scotch, highly priced and so over-hyped. Back to Blanton’s. I decided to buy myself a bottle a couple of months ago – it’s delightful. Brisbane winter evenings have been on the chilly side of late and it’s a perfect drink to warm you up. Slightly sweet and so smooth. A perfect end to an evening. Next step – marry the new favourite liquor into a cocktail. The answer: Manhattan. Made popular in Some Like It Hot and Mad Men. Described on the www.interestment.co.uk website as: delicious rocket fuel, two will have you declaring your love to people. Three will have you grabbing the mic and singing your lungs out, regardless of whether it’s a karaoke night or not. Mmmm… I agree wholeheartedly. It’s a cocktail that certain packs a punch. It is delicious and perfect as my wintry cocktail choice. 1. Fill a martini glass to the brim with ice so it chills while you make the Manhattan. 2. Add whiskey, sweet vermouth and bitters to a shaker or glass with a few ice cubes, and then stir or gently shake. Do not over do it, you do not want the ice to water down the drink. 3. 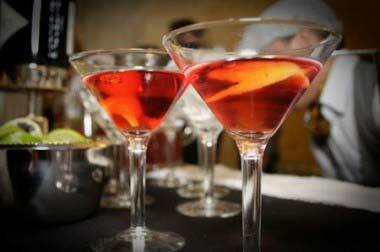 Discard ice from martini glass then strain Manhattan into the chilled glass and garnish with cherry and orange peel. Delicious and potent! 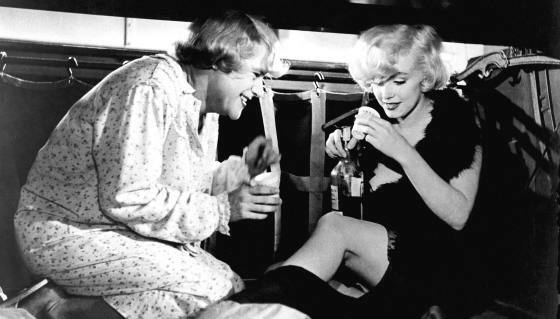 Drink with your next screening of Some Like It Hot. What’s your favourite cocktail at the moment? Aren’t they wonderful! And yes – your Charlie Chaplin is something I do indeed need to sample. Where did you taste such wonderful drinks?